Jettime 737-700 Winglets NC for the FAIB Boeing 737-700 Winglets FSX base model. Jettime 737-700 Winglets NC for the FAIB Boeing 737-700 Winglets FS9 base model. Jettime Boeing 737-300 Winglets fleet 2017 for the FAIB Boeing 737-300 Winglets FS9base model. Jettime Boeing 737-300 Winglets fleet 2017 for the FAIB Boeing 737-300 Winglets FSX base model. Jettime 737-700 Winglets fleet 2017 for the FAIB Boeing 737-700 Winglets FS9 base model. Jettime Finland is now a part of Jettime Denmark again and does no longer fly under its own callsign and ICAO code. Jettime 737-700 Winglets fleet 2017 for the FAIB Boeing 737-700 Winglets FSX base model. Jettime Boeing 737-400F Logolight for the FAIB Boeing 737-400 Logolight FSX base model. Jettime Boeing 737-400F Logolight for the FAIB Boeing 737-400 Logolight FS9 base model. SAS Scandinavian Airlines ATR 72-600 FS9 for the OSP ATR 72-500 base model. SAS Scandinavian Airlines ATR 72-600 FSX for the OSP ATR 72-500 base model. Jettime Boeing 737-400 Logolight for the FAIB Boeing 737-400 Logolight FS9 base model. 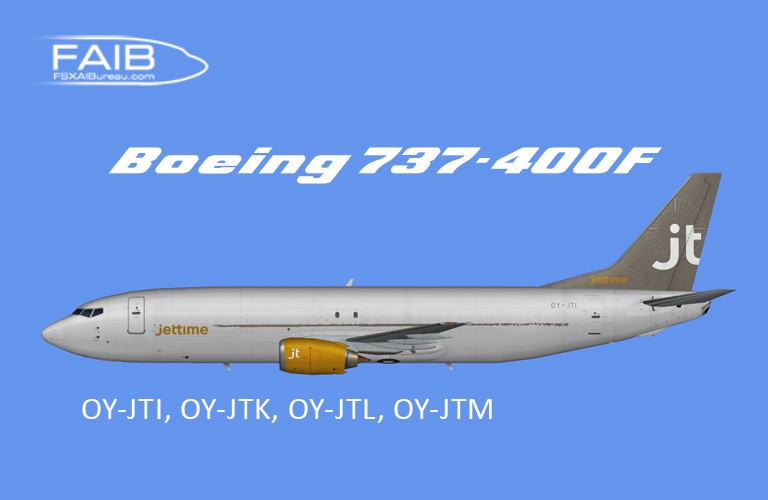 Jettime Boeing 737-400 Logolight for the FAIB Boeing 737-400 Logolight FSX base model.